An exciting gene discovery by a McGill University-led team of international scientists could soon pave the way for treatment of Leber congenital amaurosis (LCA), a devastating genetic form of blindness that appears at birth or within the first few months of life. LCA affects about one in 80,000 newborns. The team, led by Dr. Robert Koenekoop, director of the McGill Ocular Genetics Laboratory and chief of Pediatric Ophthalmology at the Montreal Children’s Hospital, identified the gene, which is called NMNAT1. One of 18 genes which are responsible for LCA, NMNAT1 is crucial for the survival of neurons. It has never before been associated with any human disease. The gene NMNAT1 is found in every cell in the human body. It produces a vital coenzyme called NAD, which is involved in hundreds of reactions in the cell. Interestingly, NMNAT1 is also part of a rescue mechanism that slows degeneration of neurons and thus helps to prevent the onset of many diseases, including Alzheimer’s and Parkinson’s. Because higher levels of NAD have been shown to significantly delay degeneration of neurons, the team’s work raises the possibility that giving NAD as a drug in young LCA patients with NMNAT1 mutations may be a potential therapeutic option to cure blindness in the near future, he added. The team has already developed a one-hour genetic test that can determine whether a newborn with LCA has the NMNAT1 mutation and costs only $1 to administer. 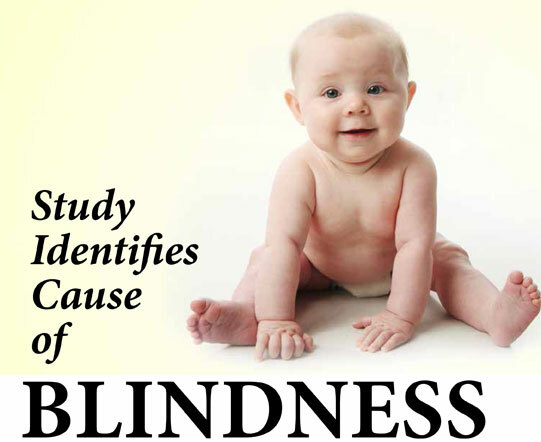 The ability to determine the existence of the mutation at such an early age is very important because LCA is a progressive disease; there is significant atrophy of the retina by age 10 so early treatment would be very beneficial. “If you think a baby has LCA (it usually becomes evident at six weeks when the infant stops looking at the parents) a blood test will determine conclusively whether the condition is present,” said Dr. Koenekoop. The project was funded in part by the Government of Canada through GenomeCanada, the Canadian Institutes of Health Research and the Ontario Genomics Institute. Additional funding was provided by Génome Québec and Genome BritishColumbia. It was also funded in part by the Foundation Fighting Blindness (FFB), a national private charity that funds vision research to find the causes, treatments and cures for inherited, degenerative forms of blindness. In addition to Dr. Koenekoop’s group, the study involved the laboratory of Dr. Rui Chen, Texas Children’s Hospital, Baylor College of Medicine,Houston; the laboratory of Dr. Jacek Majewski at the McGill University and Génome Québec Innovation Centre; The University of Leeds, UK team and FORGE Canada Consortium. The study results were published in the journal Nature Genetics.